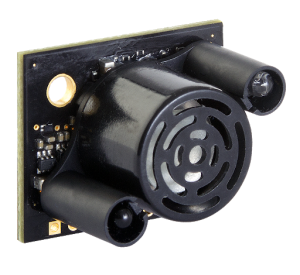 When designing an application that places an ultrasonic sensor in a visible location, users may wish to conceal the sensor for aesthetic purposes. Additionally, users may desire to hide the sensor to discourage individuals from tampering with the sensor. This article covers several methods that you may use to conceal a sensor. This article references two types of objects: standard objects that impede sound and the more unique acoustically transparent objects. Most objects will reflect, disperse, or absorb sound rather than allow sound to travel through them unimpeded. 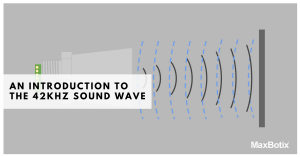 An acoustically transparent object is an object that allows the sound to pass through the object in both directions so that proper ranging operations can take place with an ultrasonic sensor. 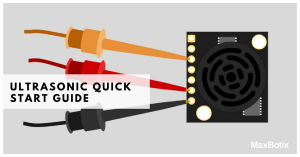 You can learn more about the general nature of ultrasonic sensors in this article. Whether or not a piece of clear glass or plastic can be used to shield our “indoor” sensors from moisture is a common question. Both glass and plastic, regardless of whether they are clear or not, are solid objects that impede sound. And our 42kHz ultrasonic sound wave cannot pass through them to complete a ranging cycle to the target beyond this shield. When this type of material is placed in front of the sensor, the sensor will typically report the minimum reported distance. Sometimes, we receive questions about the color of a material; however, color has no effect on the sound properties of the object. The only viable method to conceal a sensor in an application is to place the sensor behind an acoustically transparent material. This ensures ranging operations will not be impeded by the concealing agent. Such materials allow sound to pass bi-directionally through them. The sound can exit the sensor and the echo can return to allow a complete ranging cycle. Some examples of acoustically transparent materials are speaker grill cloth and plastic, wire screen and mesh, and open cell foam. One important consideration is that testing is always required to verify such a material. Each of these items is further described below. By design, speaker grill cloth and plastic are made to be acoustically transparent. That being said, not all cloth and plastic are created equal which is why testing is required. 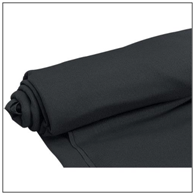 Most speaker cloth is like the one pictured in image 1. When speaker grill cloth is stretched tight, it becomes acoustically transparent allowing the sound to pass through the material. The next material is speaker grill plastic. 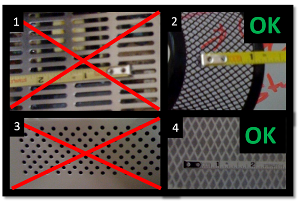 Speaker grill plastic is a more difficult material to qualify because the plastic grill pattern may reflect sound back to the sensor. This is because the width and shape of the plastic mesh can create a surface for the sound to reflect back to the sensor. Testing is critical to verify operation of the sensor after it has been concealed. Another material that can be acoustically transparent is nylon or wire screen. These typically have larger openings in the mesh pattern like that of a speaker grill cloth. This means that overall it may be easier to qualify the material; however, like with everything else, testing is required. 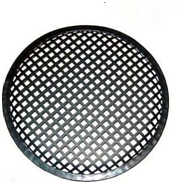 Another similar material that may be used is a heavy gauge wire mesh. A heavy gauge mesh may be used to help make a sensor more tamper resistant. Wire mesh comes in many sizes and diameters. This material can be more difficult to work with because, depending on the construction of the mesh and the thickness of the wire, it may again provide a reflection back to the sensor thus preventing proper ranging beyond the mesh. MaxBotix conducted some brief testing to show how the above information applies in a real-world application with items that were around the office. To the right, you see 4 photos that show different mesh or expanded steel. Items 2 and 4 allowed the sensor to function properly. Items 1 and 3 resulted in the sensor only reporting minimum distance. A foam is a solid containing a high concentration of gases within it. Soap bubbles and a kitchen sponge are two common foams. Foams come in two major varieties: open and closed cell. In soap bubbles each bubble contains only so much gas and gas cannot pass from cell to cell or bubble to bubble. Each cell is closed to all other cells. The small gas-filled cells in a sponge are interconnected or open and allow gases to pass between them. Open-celled foam has the unique property to be nearly acoustically transparent. Zhu, Knott, and Mills (1997), outline how the cell structure of a foam, as well as its density, impact the physical properties of the solid. In the case of open cell foam, this means sound can pass through bi-directionally to achieve ranging operations with our ultrasonic sensors. That being said, the density and thickness of the foam will make a big difference in whether or not the foam will allow sound to pass. There are other factors that must be considered and tested to qualify a material for acoustic transparency. Temperature, moisture, and acoustic return can all affect the ranging performance of the sensor and must be verified in the application to ensure success. Temperature is important due to the fact it can change the reflection properties of a material, especially an acoustically transparent material. There can be very subtle changes that may result in undesired performance. We recommend that you test the sensor in the full temperature range it will be exposed, ensuring any undesired performance is identified and resolved prior to rolling out production units. Moisture is another very important factor that must be considered. Liquid by nature creates a solid, smooth surface that is highly reflective of sound. As a result, when moisture gets on the material, the material now starts to gain such attributes that result in the liquid filling the holes or gaps in the material whether that is cloth, metal, or plastic and prevent the object from being acoustically transparent. Our own testing of speaker grill cloth showed this to be the case. Once the cloth was sprayed with water, the transparent properties of the cloth disappeared. 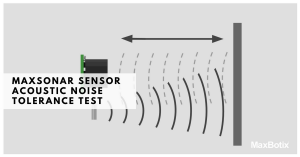 A final consideration is that the acoustic return of the sensor may be reduced when passing through a material. It is critical to verify you receive the desired detection pattern for the application with the material in front of the sensor. When mounting the sensor, we found that the sensor should be mounted within 2 inches of the acoustically transparent material for best operation. The above information will help anyone to better understand, select, and test an acoustically transparent material for the purposes of concealing their sensor or make the sensor tamper resistant. If you have any further questions regarding this topic, please contact our team. Zhu, H. X., Knott, J. F., & Mills, N. J. (1997). Analysis of the elastic properties of open-cell foams with tetrakaidecahedral cells. Journal of the Mechanics and Physics of Solids, 45(3), 319-343.